The Return to the Gold, Bourgogne, Côte d'Or, October 2000. Vogel & Fitzpatrick GbR Black Ink 2000. This year Black Ink went to the Côte d'Or a little later than usual; autumn had already arrived there and begun to colour the vineyards in hues of gold. Although the wine-growers had already brought in their harvest, there still was plenty of work everywhere around the cellars. Nevertheless we were able to degustate and to discuss the new vintage with the generous growers at the domains. We mainly sampled the 1999 harvest, which had turned out very well - and the 2000 vintage makes the growers feel confident as well. In general there seems to be satisfaction about the quality of the new harvest. The second half of the decade has meant a good time for the wine-growers of Burgundy. The following visits and degustations were carried out between 16-22 October 2000. The main focus was set on the red wines of the Côte de Nuits, but some extraordinary white and brilliant red wines of the Côte de Beaune were also included. Since different kinds of glasses emphasise different aromas we used - for the sake of better comparison - the Le Taster Impitoyable, for all degustations, which enables even young wines to develop their aroma and is therefore perfectly suitable for sampling. Our documentation is arranged in geographical order, north to south. For those people who aren't familiar with the wines of Burgundy we have provided a short introduction which can be ignored by. We regard it as important that people who are interested in good wines find their own taste, rather than relying on the decision of other tongues. The intention of the following observations is to encourage our readers to make comparisons of their own; we do not give any point assessments, since this would mean reducing wines to numbers and degrading the joy of drinking wine to some kind of sport that only seeks records. But on the Côte d'Or there are records too; and the people of Burgundy are long-distance runners. 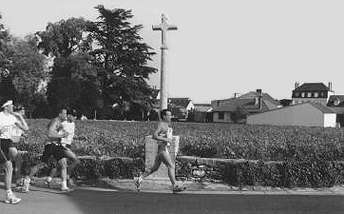 In this year's account we put in some photographs of the Côte d'Or Marathon, which we were able to witness as spectators on October 21 2000, with beautiful weather.